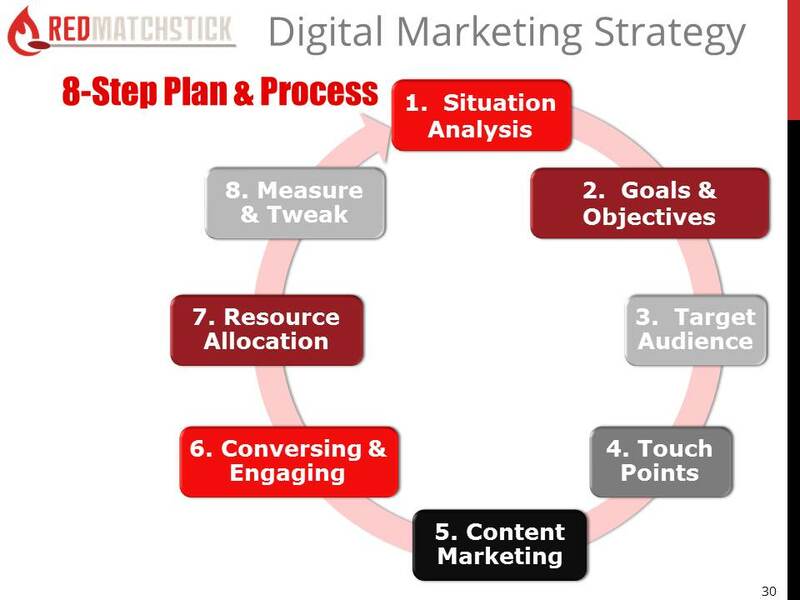 A Digital Marketing strategy is essential if you want to get good results Online. Clear direction, focus and timelines are required. The RedMatchstick Online Marketing Strategy deals with the ‘why’, ‘who’, ‘what’, ‘where’ and ‘how’. The RedMatchstick coaching program will take you through each of the 7 Steps with templates and tools to help you define and action your strategy in a simplified and actionable way, designed to bring you measurable results and good return on investment. But, only if you do the work! Who are your Ideal Customer Personas? Where will your ideal potential or existing customer “touch’ your business? What must you say, write and show? Where and how will you interact? How will you use your available time, skills, people and precious $$$? How will you monitor your progress, results and other criteria that impact on your success? Ignite your online performance with the RedMatchstick Digital Marketing Strategy that will coordinate your efforts and the make best use of limited resources, typically experienced of Small Businesses.